You'll find a lot to love at the elegant Lenox Hotel, one of Boston's luxury hotels near famous Copley Square in the Back Bay neighborhood. Personalized service and impeccable attention to detail makes the Lenox a long-time favorite of many visitors. Built in 1900 as the best of the Boston luxury hotels at that time, this independent hotel has been owned and managed by three generations of the same family since the 1960s. The owners have spared no expense in their dedication to ensuring that the Lenox continues to be the best luxury hotel in Boston. 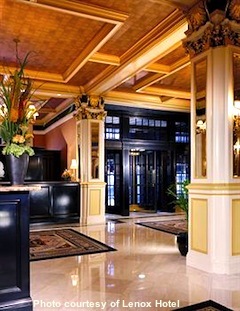 As a result of extensive renovations and multiple upgrades through the years, the Lenox Hotel Boston has been beautifully restored to its turn-of-the-century splendor. Walk through the elegant marble and mahogany public spaces filled with fresh flowers and glowing crystal lights, and you'll feel as though you're visiting a large mansion in a Merchant-Ivory movie. Because of its splendor, Lenox could easily be stuffy or pretentious - but it's not that way at all. It feels warm and homey, a place you'll want to return to every time you visit Boston, partly because of the small touches that make a difference. For example, the hotel offers you complimentary bike helmets and a map showing Hubway bike-share locations if you want to tour the city on two wheels. The Lenox also welcomes your pet. With down comforters and pillows in the Lenox's 214 rooms and suites, you'll sleep comfortably. High ceilings, brass chandeliers, paneled walls, crystal lamps, and serene decor add to the ambiance. 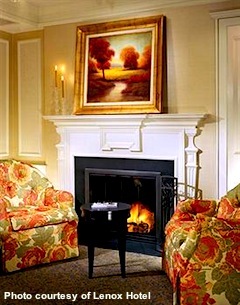 Some rooms even feature working fireplaces, the ultimate luxury in Boston accommodations. A fitness room contains top-notch equipment, so good that you'll work out a little longer than you'd planned. You can also enjoy the services of one of Newbury Street's top spas. The Lenox uses environmentally friendly cleaning products and extends this earth-awareness by providing a hybrid car service for guests. If you suffer from allergies, request one of the "PURE" rooms with state-of-the-art air purification systems. What Else Will You Find at The Lenox? 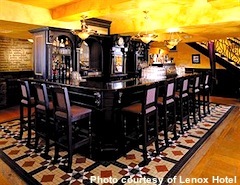 Although the Lenox Hotel Boston's excellent Back Bay location means that numerous excellent restaurants are just a short distance away, you'll also find three good choices right at the hotel. City Table restaurant specializes in updated American classic dishes made with fresh organic ingredients. Sólás, shown in the photo at the left, is a cozy Irish pub with big screens for watching sports, and City Bar is exactly what its name suggests - a pleasant and sophisticated city bar. But again . 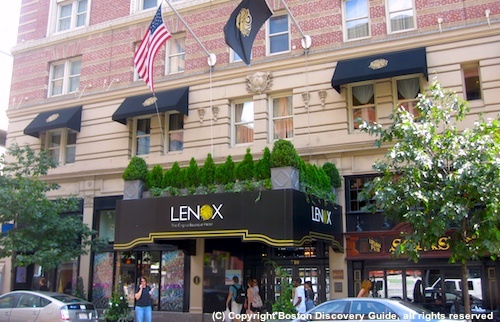 . . what makes the Lenox Hotel one of Boston's best is the top-notch, attentive service dedicated to helping you have a great stay in Boston. If excellent service is your idea of luxury, then you'll find the Lenox truly luxurious. Surprisingly, you can sometimes find very good rates at the Lenox, especially during the winter months . . . but even the regular rates are quite reasonable, considering the quality of this hotel and the pampered experience you'll have here. Other luxury hotels may be glitzier than the Lenox. But none are finer.